I would try emailing them pictures of your current EVSE showing any model and serial numbers, they might take that. I did that for the modem replacement (since I had removed the original because it kept draining the battery) although maybe they accepted that because for me it's a 80 minute drive each way. I am curious if the replacement charger look like this... Any improvements compared to the original charger? Smaller, does it stay cooler? Well, I hope it fits in the molded spot underneath the driver's seat, or that they replace the seating for it. That one in your picture looks exactly like my cord for my Pacifica Hybrid, except with a different logo. That unit certainly stays a lot cooler than the Ford one, even on an extension cord. I thought this was a recall. My letter stated as much, but I have yet to receive a second letter that mine is available. I would think Ford was replacing all thermistor less EVSE plugs to avoid the possibility catastrophic damage injury linked back to a fire caused by a hot plug. Weird that FMC isn't supplying them in this quarter as they stated. Maybe they are just a bit delayed in the shipment from China? I haven't received the second letter, but the NHTSA recall no longer shows "repair parts not available" and my dealer says they have my new cord on order (though it is dumb that I had to show them my cord first). "Parts are now available to repair your vehicles." Received my second letter yesterday. It states that the charger will be replaced (after inspection) with an updated cord which includes a thermistor and an updated trunk storage container. Not sure about that since we have a carry case for ours and a beneath-back-seat-foot storage area for travel storage. We just replaced our outlet so it's time to get charger replaced. Edited by rhea, 13 April 2019 - 04:12 AM. The "updated trunk storage container" is a soft case. I haven't fought it much yet but it doesn't look like they think it'll fit in the under front seat slot. Amusingly they looked in my trunk for the old "trunk storage container", which doesn't exist of course. Just got my appointment for May 8 "we have to order it!" for the cable swap. What fun. Got the recall done last week. I don't use the supplied EVSE as I have a level 2 setup at home. Only use the level 1 unit for travel. They said it would not fit in the original storage space and included a cheap bag for the new one. I wasn't happy about that so I thought I'd try to see if it fits. I am happy to report that the new EVSE fits in the floor storage space just fine. Edited by impaladb, 20 April 2019 - 08:13 AM. 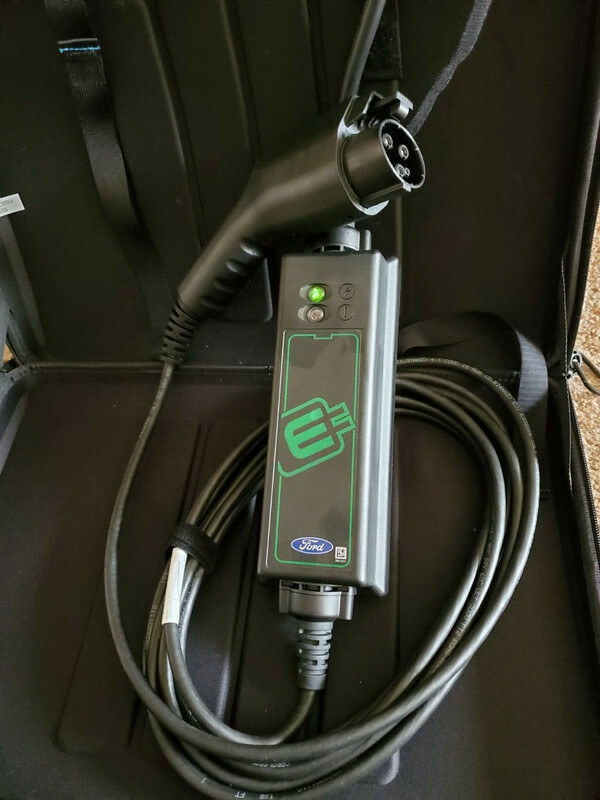 I got the second letter from Ford saying that the dealer had the new EVSE in stock. I took in the letter in with the damaged EVSE to the local dealer. Dealer told me our EVSE (replaced the first under warranty) with a melted plug wasn't on the list of recall (even though it melted at the plug and stopped working). They called Ford. I was told to pound sand. Guess it doesn't matter that the thing melted in the outlet. Outlet works just fine. Wonder if anyone else is bringing in letters and EVSEs and getting denied? Honestly it's easier to fit in the floor spot than the old one was. I received my letter and brought in my EVSE, but it wasn't replaced. The only thing Ford is doing is replacing EVSEs that match a certain part number regardless of if they are damaged or not. The part number will look something like this (F58-10B706-AA). The last two digits of the part number need to be AA, AB, AC, AD, AE, or AF in order for you to get a replacement. Mine had an AJ part number. That being said, I haven't had any issues with my EVSE. Thanks for the information. Checked my part number and it ends in AG. I had my original charge cord replaced under warrantee quite some time ago as a safety issue when it would not shut down charging when pressing the control prior to removing the cord during the charge cycle. I have not had any issues with the current charger although I do not use it often since I have a level 2 charger. Ditto, I have one that is an AE so it should be replaced but I don't have that car any more I got a 2017 now. I hope they will still replace it for me as I use and it still gets hot I plug it into an extension cable so as not to burn the outlet itself I've had to glue the plug probe back into the plug as it got loose from the heat a while back and it seems to be getting loose again. As I posted a few years back, both mine were outlet toasters. Second one, I dissected and it did appear there was a tiny thermistor soldered in but it was hard to tell due to size and encasement in the rubber. Recall Questions about Trim Removal and More?